I am an amateur photographer so I am always behind the camera which means that there are only a few photos of me and the kids. Each year around Mother’s Day we have a family picture taken by a photographer so I actually make it into the photos. Yesterday we went to the beach for the annual picture, and each year it gets a little easier. The kids will look at the photographer at least occasionally, and sometimes even at the same time. I graduated from a college photography program before digital photography became accessible to the masses. There are those that would say that digital photography has taken away from the art of photography, and I would tend to agree. But I would also say that it has afforded those of us that are inclined to take photos a million more chances to snap a good shot. I remember taking both slide and film photos and praying that there would be at least one good shot in the bunch (to hand in for an assignment) and waiting days for film/slides to be developed, only to have to repeat the shots. Granted a lot was learned though carefully setting up shots, but I can’t even image how many rolls of film it would take to get a shot with multiple children looking in the same direction with their eyes open. I am hoping that Nicola (our photographer) was able to get a couple of good shots of our crew. Here are a couple of quick shots I took while the kids were playing at the beach. Logan our 2.5 year old has a habit of saying smile (instead of smiling) when someone points a camera at him. 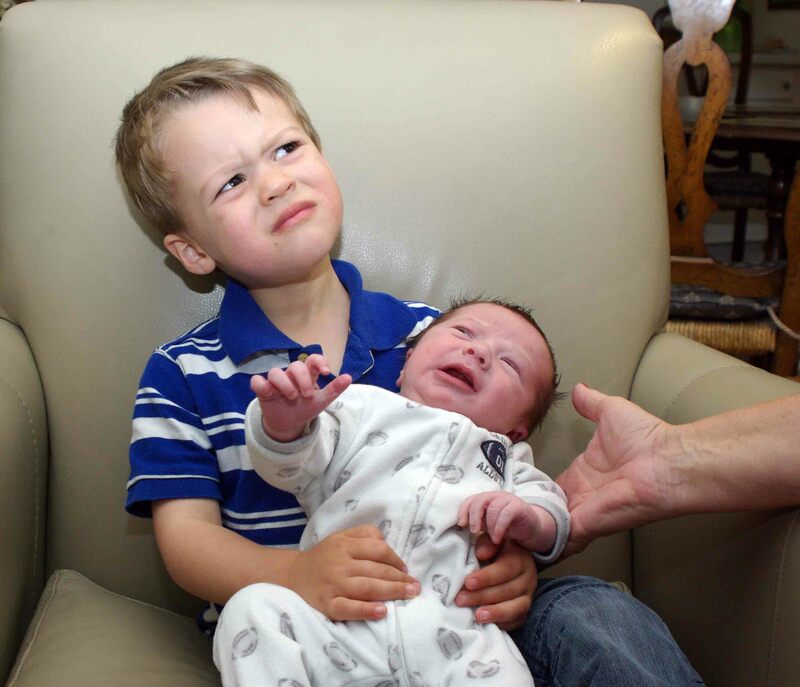 His older brother is trying to teach him how to smile in this photo. I took these when we were in Welland last month. Logan is clenching a gummy worm in his hand because when all else fails opt for candy, it’s sure to get a smile. I needed to throw this one in there because I am keeping it real. Logan was yelling “get this thing off of me”, poor Bennett. Definitely no smiles in this photo.